The authorship of the Tempesta was already advanced (1999, p.146, pl. I. and pp. 514-15, nn. 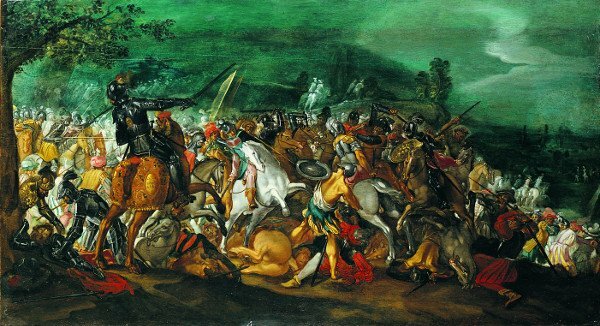 3-4 ) for these two important "war scenes", but with a question mark as an alternative to Filippo Napoletano, which had been ascribed to L. Salerno, but not confirmed by M. Chiarini in his recent monograph on the master. A review of the two stylistic scenes, also in the wake of subsequent studies, on Tempesta and Filippo Napoletano, the hand of the former is of obvious evidence in the "Battle", in which are inserted several figures, such as the two rearing horses, addressed conversely, that seem directly transposed from similar images of his vast repertoire etching. But all the figures, even those of the dying leader, assisted by two warriors - probably alluding to an historical event - stand out with firmness his engraver, such as that almost always detectable in the few paintings of the Tempesta. 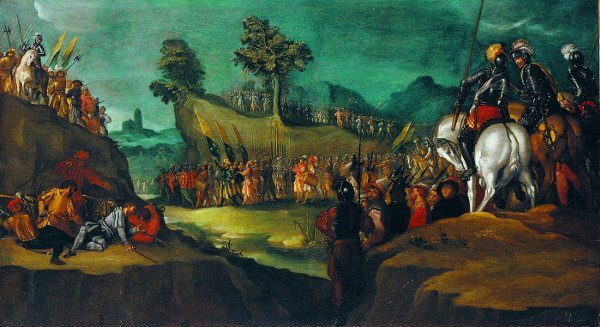 In this regard, we can cite the recent acquisition in its catalog: the "Battaglia con assedio di una città", oil and gold on wood, bidded at Sotheby's New York (January auction 2008, lot n. 224). Turning to the framework of torque, it may in fact underline its convergence in the taste of the general by's layout, with works by Filippo Napoletano, such as the "Adoration of the Magi" from a private collection and the "Calvario" of Palazzo Pitti (Sestieri 1999 fig. 7; Chiarini, 2007, nn. 741), proving in my opinion a mutual influence between the two, explicated directly or indirectly in the field of Florence. But even in this painting figurative footprint is fully responsive to that typical of Tempesta, with a 'start-up pose' of the characters emerging, in appearance, carefully delineated.